Thanga Magan is the story of a guy who belongs to a middle-class family. Dhanush loves Amy Jackson in his young age and the duo spends some quality together. But, his parents oppose his love since Amy Jackson belongs to other community and she has a rich family background. Main plot revolves around, what happens when an unexpected incident happens to Tamizh’s father, how does it impact Tamizh’s routine life and how he overcomes from this situation. M.V.Rajesh Kumar. Biggest strength of the movie is its duration, The film is just crisp 2 hrs. scenes and no separate duet tracks. Picturization of the songs should be appreciable. Anirudh’s BGM is not as impressive as VIP .K S Ravikumar as Tamizh’s father, one of the finest actor. Wonderful performance, he emotes really well. Dialogues are important enough to be noticed.He has made a cameo appearance. There are no mass scenes like VIP. 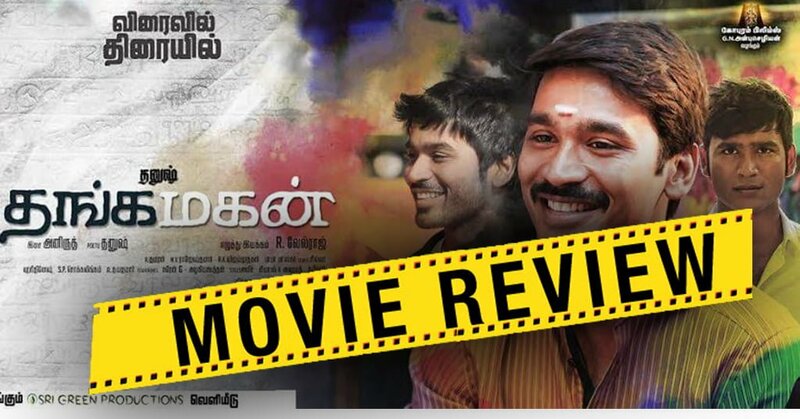 Main highlights of the movie are national award winner Dhanush’s flawless performance, the feel good and emotional family sequences, DhanushSathish comedy scenes and Dialogues. Slow moving second half and the antagonist role are the negligible drawbacks.Overall its a simple movie which is worth watch. The Only Big Budget Tamil movie releasing this weekend. Huge star cast, Dhanush, Samantha, Amy Jackson, Sathish, K.S.Ravikumar, Raadhika, M.S.Baskar. Songs of the movies are already super hit, its an another Anirudh musical treat. VIP team who gave us blockbuster Vellai Illa Patta again joining with full energy. Two female leads, Samantha and Amy Jackson. Amy plays the role of an Anglo-Indian girl and Samantha plays the role of Dhanush’s wife.